Solid State Sound Recorders and their associated kit (microphones, etc.) are a valuable investment which can all too easily be damaged beyond repair if dropped. It is no wonder, then, that many of our customers choose to store their equipment in one of our hard cases. The case in our picture shows just one equipment storage solution (sorry, recorders & microphones are not included in our case prices!). The customisable 'pick and pluck' foam insert in all our cases (listed below) allows you to choose your own arrangement and add other items. All our hard cases are made by Peli and they are completely unbreakable, watertight, dustproof, chemical resistant and corrosion proof. In other words, they provide total protection for your equipment. They are made of Ultra High Impact structural copolymer that makes them extremely strong and durable. Their exclusive 6.4 mm neoprene O-ring and ABS latches seal perfectly and includes an automatic purge valve for quick equalization after changes in atmospheric pressure. Your equipment can fit into the high density foam of the case for total subjection and protection against impact, vibration or shock. NB - Please be careful with your measurements. We cannot exchange a case if it or its packing box has been marked or damaged, or if its foam insert has already been customised. 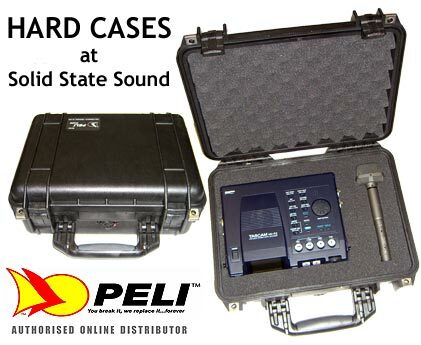 The Clamshell is the ideal case for our medium and small sized solid state sound recorders and their accessories. Note its combined ability to accommodate a decent pair of headphones as well - the pair shown are a medium sized on-ear type but The Clamshell is big enough even to fit a full sized pair of enclosed studio headphones if required. So if you need to be out and about with all your kit well protected on the way, and without costing you a fortune, The Clamshell ticks all the boxes. The internal recorder compartment measures approx. 20 x 12cms. Perfect for medium sized devices. Smaller recorders may benefit from being wrapped in, say, a cloth or duster. 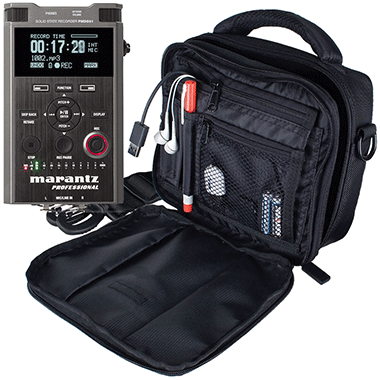 Our "Paddy The Padded Bag" is just that - a really good padded carry bag for your valuable handheld recorder. But not only that - it has room for your stick mic and cable as well as some lapel mics and all the bits and bobs you need when your out and about on a reporting assignment. It fits the Marantz PMD561 and 661 range most perfectly, but will also accommodate several others from Olympus, Sony and Zoom (see list below). Manufactured with a strong padded outer shell, the interior is lined with a soft nylex lining and features a modular layout design, using two movable modular walls for a universal fit. Additional features included a spacious gusseted front pocket with organizer, contoured handle with mesh grip, rear exterior sleeve for quick access to accessories, and a built-in rain jacket for thorough weather protection. 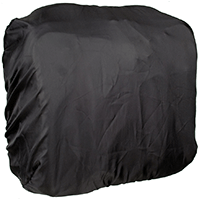 Solid State Sound PADDY THE PADDED BAG for most Handheld Size Recorders & Accessories - a really cosy padded safety zone for your recorder and accessories. Perfect for protecting not just the recorder itself but your stick microphone, lapel mics, etc, as well. Genuine suede straps. Rugged Cordura fabrics. The hallmarks of the famous Portabrace field production case. Hand-crafted, form-fitting, performance-enhancing cases sought-after by field and location production professionals worldwide. 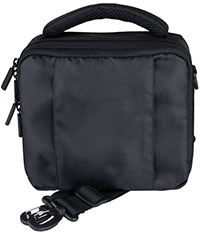 Portabrace was founded in 1972 at the inception of field video and audio recording, so a Portabrace case really is the original field production case. 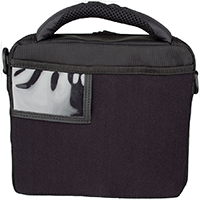 And the care they take in both their case design and skilled manufacture has ensured they are the leading equipment bag maker for the media world. Their attention to detail means Portabrace still take the time to inspect every case before it’s shipped to you. They appreciate fully the value of your equipment, and understand that there are no second chances in field production. Award-winning recording opportunities can be missed in the blink of an eye, so they design their cases to be integral to your field performance and then build them to the highest quality and performance standards. 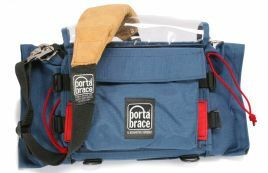 We have considered a lot of soft kit bags and cases and, in our view, Portabrace are still the leaders. Their cases will not only protect your valuable investment in equipment but make it possible for you to use your kit quickly and efficiently in the field. Just how it should be. Our most popular AR-SF1 Portabrace bag is shown for sale below. It fits many of the smaller and medium sized portable recorders we sell - see the list and click on the blue links for more. If you need any other Portabrace kit bag not shown here but which is on their US-based website (here), then we can also order it from them for you - please email us for a quote at sales@solidstatesound.co.uk - it normally takes only 2-3 weeks for an order to come in for you. 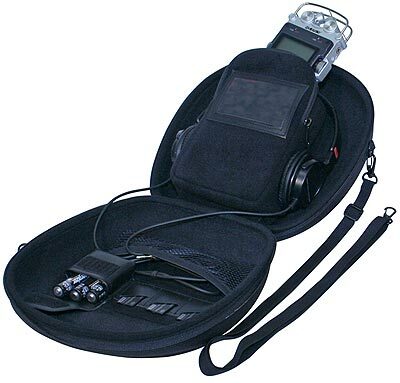 Portabrace AR-SF1 Heavy Duty Soft Case for most Handheld Size Recorders & Accessories - just position the recorder in the case where you want it, then fix the Velcro provided to its back. This fixes it in position ready for use and enables you to access all controls on the front and sides. It's a really good solution.